The outside world knows them as Barb Fellows-Krauss and Dale Krauss. But inside the walls of West Godwin Elementary, they are Grandma Barb and Grandpa Dale, the caring couple that spends several hours a week helping kindergarten teacher Lynn Bradford. Grandma Barb is Bradford’s mom. Since retiring 10 years ago, she has spent her free time doing tasks around the school, from putting books away to helping at lunch time to teaching young students their ABCs When she married Krauss three years ago, he also started volunteering at school. During a recent session, the couple called on students, one by one, to review “popcorn words,” which are words they should be concentrating on that “pop” up often in their reading. “These are new ones, ‘go’ and ‘to.’ You did very well,” Grandpa Dale tells Aiyana Grider-Chambers. Excited, Aiyana sounds out the words that will build her vocabulary for years to come. “Open your book. Read the ones that you know,” instructs Grandma Barb nearby. “Do you know this one?” “ ‘Go,’ ” Emely Bermudez-Hernandez reads. “This one,” Emely says, pointing at a purple sticker. At West Godwin, grandmas, grandpas, moms, dads and more can volunteer through programs like Schools of Hope and One Wyoming 1 on 1. Both require weekly meetings with students, Minard says. Another program, Watch D.O.G. Dads (Dads of Great Scholars) encourages fathers and grandfathers to spend a day at the school with their children. Grandma Barb says the reason these programs succeed in helping students is simple: Children just like to have people pay attention to what they’re doing. 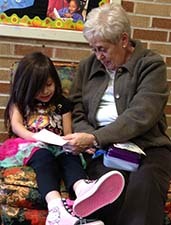 She encourages everybody to volunteer, especially grandfathers, who are scarce. “They eat grandpas up because they don’t have that many grandpas around,” she says.